Nestled between the United Nations and Grand Central Terminal, The Westin New York Grand Central is a welcome respite in the heart of Midtown Manhattan, convenient to Times Square, Broadway and Rockefeller Center. The property has 774 spacious, eco-friendly guestrooms and suites, each boasting more than 300 square feet of space and offering the full suite of Westin signature amenities and services, including the iconic Westin Heavenly Bed. 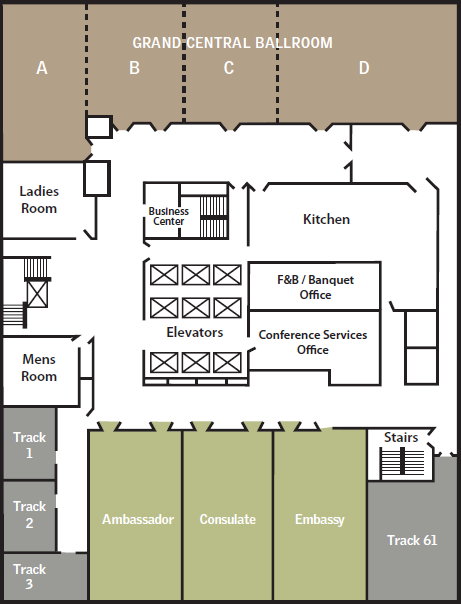 Other hotel features include 15,000 square feet of banquet and event space, WestinWorkout gym and The LCL: Bar & Kitchen. Description The hotel currently has over 15,000 square feet of event space. Floor-to-ceiling windows offer natural light and sweeping views of midtown Manhattan and beyond. Measuring 4,220 square feet, the brand new Grand Central ballroom can easily accommodate up to 455 people. Three executive board rooms and seven additional meeting and breakout rooms make ideal environments for smaller groups. Madison Ballroom provides an additional 2,800 square feet of event space ideal for social functions. Space Notes Meeting space is equipped with teleconferencing capabilities, ergonomic seating, fiber optics, and some of the highest bandwidth available for New York City conferences and meetings.